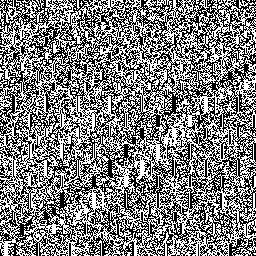 In games and graphics one often needs to generate pseudorandom numbers. Needless to say, PRNGs are an extremely well-researched topic; however, the majority of the literature focuses on applications with very exacting quality requirements: cryptography, high-dimensional Monte Carlo simulations, and suchlike. These PRNGs tend to have hundreds of bytes of state and take hundreds of instructions to update. That’s way overkill for many more modest purposes—if you just want to do a little random sampling in a game context, you can probably get away with much less. To drive home just how much lower my random number standards will be for this article, I’m not going to run a single statistical test on the numbers I generate—I’m just going to look at them! 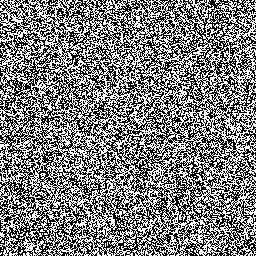 The human visual system is pretty good at picking out patterns in what we see, so if we generate a bitmap with one random bit per pixel, black or white, it’s easy to see if we’re generating “pretty random” numbers—or if something’s going wrong. The one on the left is a linear congruential generator (LCG), and on the right is Xorshift. We’re always told that LCGs are bad news, and now you can see just how bad! Xorshift, on the other hand, is much better. 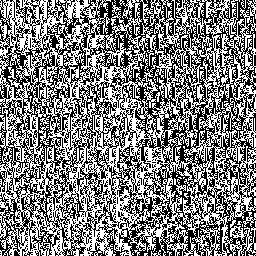 It’ll actually pass some medium-strength statistical tests, and it certainly looks random enough to the eye. Moreover, it’s quite fast compared to other PRNGs of similar quality. LCGs are really fast—updating the state takes just one imad instruction (in HLSL assembly, which is just an intermediate language, but still a reasonable proxy for machine code speed). Xorshift is a bit slower, requiring six instructions, but that’s not bad considering the quality of random numbers it gives you. Figure two or three more instructions to get the number into the range you need, and convert it to a float if necessary. On a high-end GPU, you can generate tens of billions of random numbers per second with these PRNGs, easy. Again, on the left is the LCG and on the right is Xorshift. The LCG doesn’t look too different from before, but Xorshift looks absolutely terrible! What’s going on? PRNGs are designed to be well-distributed when you “go deep”—draw many values from the same instance. Since this involves sequentially updating the state after each value, it doesn’t map well to the GPU. 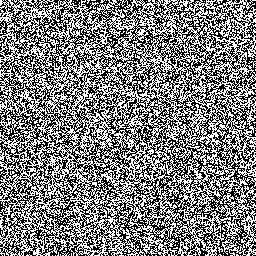 On the GPU we need to “go wide”—set up a lot of independent PRNG instances with different seeds so we can draw from each of them in parallel. But PRNGs aren’t designed to give good statistics across seeds. 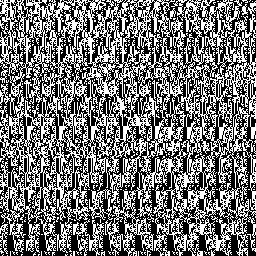 I tried several small PRNGs I found on the Web, and they all produced obvious artifacts when going wide, even if they were perfectly fine going deep. 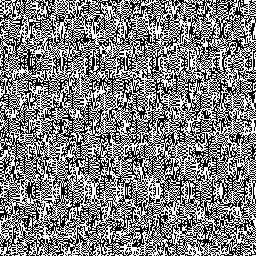 It’s better, but there are still pretty obvious nonrandom patterns, even 64 iterations deep into each sequence. We need another ingredient. Fortunately, there’s another kind of pseudorandom function that’s explicitly designed to be well-distributed when going wide: hash functions. If we hash the seed when initializing the PRNG, it should mix things up enough to decorrelate the sequences of nearby threads. 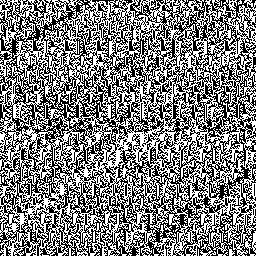 To the eye, it’s indistinguishable from true randomness. In fact, we could just iterate the Wang hash and it would make a perfectly good PRNG. However, it’s a few more instructions than Xorshift or the LCG, so it’ll be a little slower. It makes more sense to use the hash as a high-power tool to obliterate any correlation in the seeds, then turn things over to one of the PRNGs. To sum up: if you need quick and easy GPU random numbers and don’t have stringent statistical requirements, I recommend either an LCG (faster) or Xorshift (better distributed when going deep), seeded using the Wang hash in either case. These are both great choices that are quite fast and will most likely give results plenty good enough for games and graphics applications.